Have you heard the buzz about meal subscription services, but aren’t 100% sure if they are a right fit for your family? Depending on where you live, there can be a lot of selection to choose from. How do you know if they’d benefit you? Take a look below at the six reasons to try meal subscription services so you can see what all the fuss is about and decide for yourself if they are something you want to try. 1. A deeply discounted introduction box. Meal subscription box companies WANT you to try them. Many of them offer introduction boxes for as low as $20. Check RetailMeNot.com for discount codes available on these boxes and by all means, use them! 2. Earn credits towards future boxes. Once you try a box, even at the discounted rate, you can use your referral code to refer others. Not only will they get a discount when they use your code, but you will earn credits towards future boxes. This is a great way to enjoy more boxes in the future for cheap or even free. 3. Choose from vegetarian, paleo, and specialty diet options. Do you have dietary restrictions? Various plans offer various options. Hello Fresh offer vegetarian meals, while Green Chef offers paleo meals. Don’t worry about having dietary restrictions, as chances are, there is still a box that can suit your needs. There are even boxes that provide meals free from gluten and artificial ingredients. 4. Choose from boxes suited for 2 or even a family size of 4. Meal boxes aren’t just for singles or couples. Many of these services are offering a family plan as well that is suited to fit a family of four. This is perfect if you have a larger crowd to feed and want to make the experience a family one. 5. Forget last minute trips to the grocery store and avoid the take out trap. When you belong to meal subscription services, you can avoid the costly take out trap and those late minute grocery store runs. Instead, you’ll have fresh ingredients and recipes you need on hand to cook up something amazing in under 30 minutes. 6. Enjoy trying new recipes which can try on your own again and again. Most of these services come with recipe cards you can use again and again. If you get a meal you love, save the recipe card and shop for your own ingredients in the future. These box services are a great way to find new recipes and experiment with new tastes that might become favourites. Are you ready to give a meal subscription box a try? I’d love this, especially because I love trying new recipes! 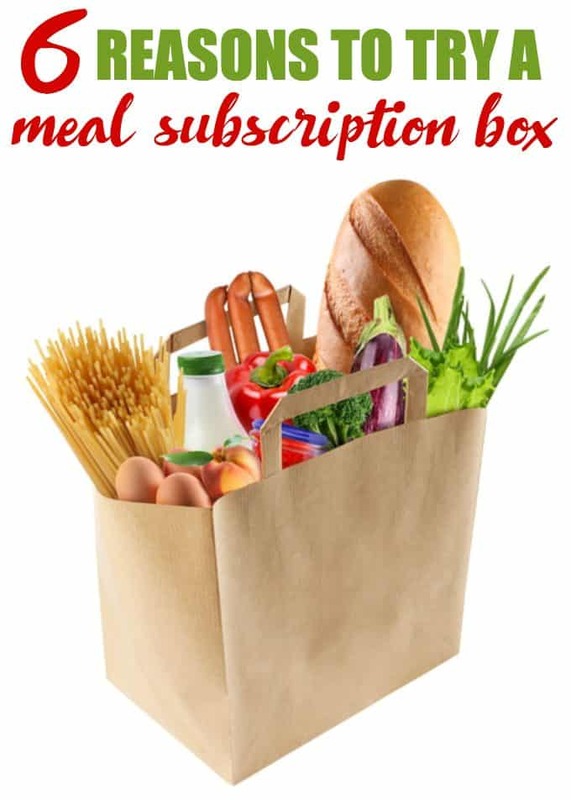 I wouldn’t mind trying some of these subscription boxes out, I do enjoy cooking and I only go to the store because mama here has to eat LOL, But serious this would be nice and will check some of them out.